Over the next several months, we will highlight profiles of our 2017 TIHAI Student Scholars awardees. We are grateful to the Elizabeth A. Lawrence Fund through the Center for Animals and Public Policy for supporting the Student Scholars Program. While historically considered agricultural animals, horses have transitioned to play a dual role in society as both a working animal and a companion animal. Despite this overlap with more traditional companion animals like cats and dogs, there are still unique factors about horses, like their lifespan well into their geriatric years and requirement of commitment to care that make them unique. While the benefits of companion animals are often studied, the challenges of pet ownership, like caregiver burden and end of life decisions, particularly in the horse community, are often overlooked. 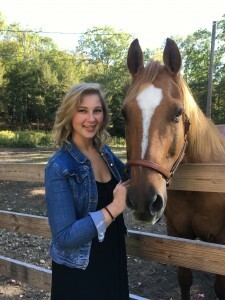 The experience of caring for a geriatric horse in terms of the physical and emotional caregiver burden an owner perceives could relate to the quality of care a horse receives, as well as the bond and attachment. Likewise, the bond and attachment may relate to the experiences of physical and emotional caregiver burden the owner reports. Understanding these ideas are important to three stakeholder groups. First, conclusions will be helpful for the equine community to help define best care practices and cope with the challenges. Next, veterinarians will benefit by having insight into ways to best meet the needs of clients and make care efficient. Finally, the geriatric horses will benefit if experiences of care burden can be acknowledged and ways to cope can alleviate any obstacles that may take away from optimal care. Therefore, the purpose of my research study was to investigate how an owner’s emotional and physical experience of caring for a geriatric horse with a chronic condition compares to an owner’s experience of caring for a geriatric horse that does not have a chronic condition. Additionally, this research explored the experiences of bereavement that an owner of a geriatric horse may have upon the death of the horse, using in depth interviews. My research experience at Tufts allowed me to interact with different stakeholders in the equine and veterinary communities. This experience also allowed me to articulate my career goals as an equine practitioner who provides veterinary care, sets a standard of care within the equine community to ensure high welfare, and most importantly characterizes a horse’s role so both the horse and community may benefit.